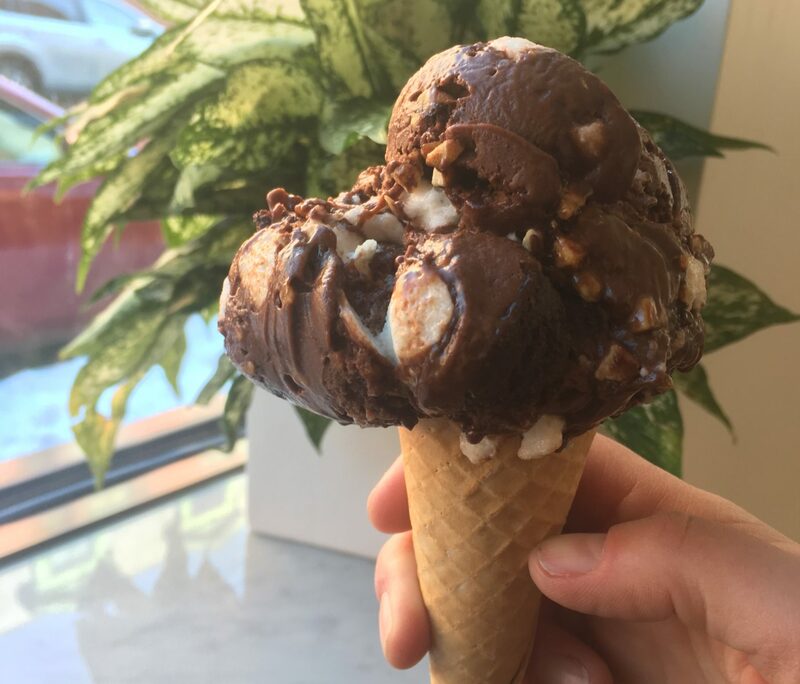 Cool off and enjoy your fill of Boston’s best ice cream when you go on this scoop-shop crawl. Bostonians eat ice cream at an almost feverish rate — around the clock and in every season. And as a longtime Bostonian and one-time editor of a cheese magazine, I know dairy — ice cream included. 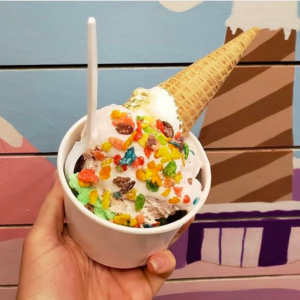 So join me on a crawl of Greater Boston’s sweetest scoop shops: some are institutions, some are newcomers, but all churn out frozen delights well worth a taste. For years, we bemoaned the lack of ice cream in Somerville’s Union Square, a hip enclave north of Boston. After all, it’s located just down the street from Davis Square, where Steve Herrell opened his eponymous cafe in the early 1970s, introducing mix-ins and ushering in ice cream’s modern age. Our wishes finally came true in 2014, when Gracie’s appeared on the scene, offering dreamy flavors like Birthday Cake Batter and Day After Easter On Sale Candy. Marshmallow fluff–dipped cones are torched by hand for a s’mores vibe, and there’s a kaleidoscopic mural listing a rather whimsical rundown of ingredients (rainbow extract, unicorn whispers, essence of thunder, hugs). Order a bowl of your favorite cereal (Fruity Pebbles, anyone?) on the side and leave with an ear-to-ear grin. My husband is a cookies ’n’ cream fiend. When he gets a hankering, we head to J.P. Licks, where the sandwich cookies are crumbled generously into flavors like mint and coffee. The shop has multiple locations in Boston, but my favorite is the flagship in Jamaica Plain (hence the J.P.). Housed in a Victorian-style former firehouse, it often smells like coffee, thanks to the beans roasted on-site, and features a statue of its mascot, Clementine the cow. Bovines aren’t the only animals that get the star treatment here, however: our labradoodle goes gaga for Cow Paws, a Fido-friendly peanut-butter-and-honey sorbet crowned with a mini dog bone. Boston sundae lovers come out in force for the annual Jimmy Fund Scooper Bowl benefiting cancer research and care at Dana-Farber Cancer Institute. 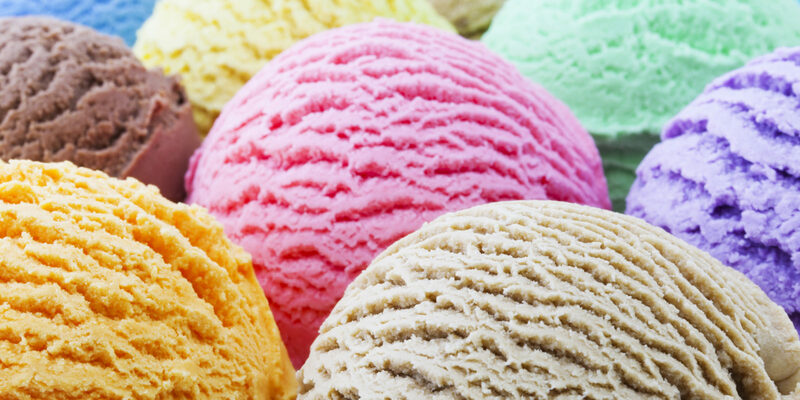 This year, the all-you-can-eat ice cream festival takes over City Hall Plaza from June 5 to June 7. Ready your spoons! Not only is this Cambridge newcomer one of the prettier ice cream shops I’ve seen, but it also has a hipster pedigree: co-founder Kristen Rummel is the former kitchen manager at swooned-over Union Square Donuts. She has a knack for working with fruits, vegetables and herbs. The lavender in the Honey-Lavender hits first, followed by a creamy sweetness, and the Ube Coconut, made with roasted purple yam, is a must. But this serious experimentation doesn’t mean Rummel and her waffle cone–making husband, Rory Hanlon, are all business. Stop by on Taco Tuesdays to snag a Tea & Biscuits (Earl Grey–infused London Fog ice cream in a vanilla shell, dipped in a lemon-white-chocolate and studded with housemade vanilla shortbread) or a fried cannoli stuffed with lemon-ricotta gelato. The creative offerings change regularly. I once finished a 200-mile relay race across New Hampshire with a mean craving for ice cream — specifically the roasty-toasty Burnt Caramel at Toscanini’s, slathered with the shop’s stellar hot fudge. So intense was said craving, we stopped there first upon our return to Boston, hungry and un-showered (a retroactive apology to our fellow customers that afternoon). 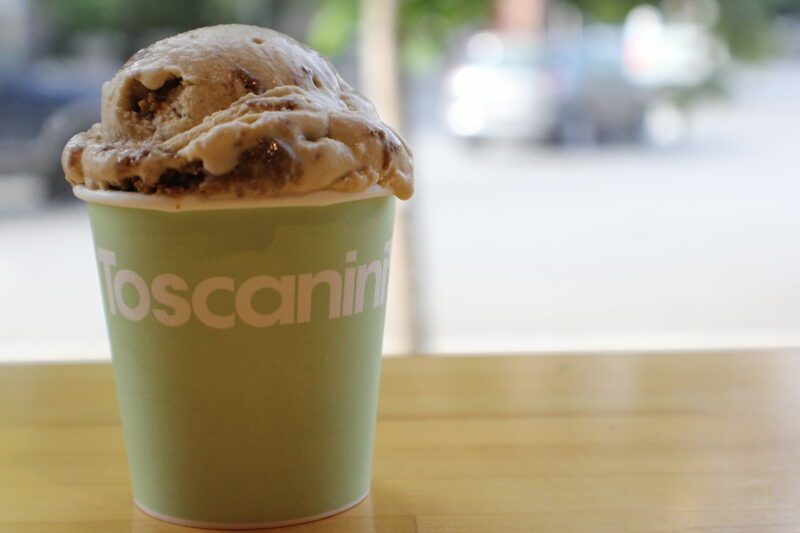 The Burnt Caramel is my usual paramour (Toscanini’s is the only place where I’ll cheat on chocolate), but B3 — a lick-the-bowl-good blend of brown butter, brown sugar and brownies — is a close second. On days when I haven’t run 16 miles, the cute micro-sundaes here, served in espresso cups, offer a perfect dose of decadence. Self-described hippie lawyers Robert Rook and Richard Rubino launched Emack & Bolio’s in a Brookline basement in 1975, where they served up homemade ice cream to their local musician friends after the clubs closed. Fast-forward 43 years and Emack & Bolio’s has managed to retain its rock ’n’ roll ethos even as it has opened locations around Boston and the globe. As an aspiring music journalist fresh out of Boston University, I loved the brand’s psychedelic paint job, bright walls emblazoned with mascot Stoney the Moose and far-out flavor names like Space Cake and Deep Purple Chip. Even the signature ice cream pizza, which serves 12 to 15 adults, comes topped with a peace sign. Rock on. Lactose-intolerant? Gluten-sensitive? Tree-nut–free? Never fear, FoMu is here. Founders Deena Jalal and Hin Tang and their team start with a coconut-cream base incorporating little air, which results in a rich mouth feel. Housemade shortbreads, cookies and extracts, plus locally sourced products such as George Howell Coffee and MEM Tea, round out the ingredients list. You won’t miss the dairy: On a recent afternoon at FoMu’s darling South End cafe, the Peanut Butter Mud Pie wowed me. Who knew coconut and PB are a match made in dessert heaven? Meanwhile, the Rocky Road — an almond-milk base laden with brownie chunks, marshmallow and toasted peanuts — was the most deliciously packed ice cream I’ve ever devoured.